Saturday was crazy dude! I woke up early in the morning and went out of the house exactly at 0900 in the morning. From Seremban, to Putrajaya, to KLPAC, to Lowyat Plaza and get back to Seremban. 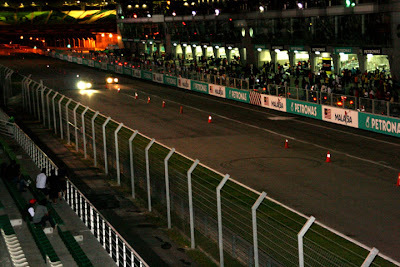 As I was home, my brother in law was waiting to ask me out to Sepang. Hmm.. Let's see what do we have in here..
Crazy man!!! 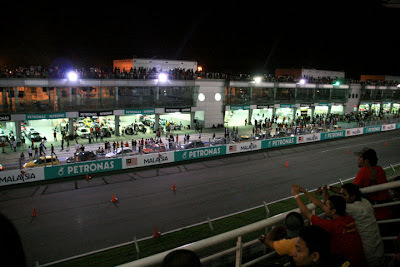 It was already 1AM but there were still a lot of people in the Sepang International Circuit, waiting for the drag event to continue. The event organizer was kinda moron. There was a lot of rerun. It was going WAY LATE! It was loud man! Super duper loud! Turbo cars sounded like NA, just like in the Fast and Furious. And an NA VTEC running 400m below 12s? That was fast! There were not so much supercars coming but small cars can be frightening. A mazda I believe with a B8 engine inside has been the fastest afterall as his best elapsed time was recorded at 10.4xx seconds. Damn fast! Kancil running 400m in 14s? Scary...! Well, the event ended at around 4 something and me and my brother in law walked slowly heading to the car. Well, that was not the thing that is what I'm gonna talk about. As I walked out of the circuit, I saw many girls were still with their boyfriends walking together no matter what, as unfortunately, as we were walking out, it's raining heavily all of a sudden. I envied their boyfriends. Or whoever, either fling, fuckbuddy, sugar daddy, pimp or just a friend, they were able to wait till the event end up at 5AM. It was raining at 5AM and those girls were easily walking holding hands with whoever male they're walking with. They must be really sayang to the partner. Nice eh? Not easy to find those kind of girls nowadays. Berkorban apa saja. Harta atau pun dara.. eh opocot mak kau silap.. hahaha..